Engines had full service costing £700 in 2011. Not many additional engine hours since due to owners ill health. The hull on this vessel still has a lovely lustre and attractive lines. The engine has low hours so this Sealine 420 Statesman is an exceptional example for her age. She has a galvanic iscolator. There is a favourable survey from 2011. This boat is easy to handle with twin Volvo's, Bowthruster with dual controls and trim tabs with dual controls. The accommodation is bright, airey, spacious and well appointed. The woodwork looks lovely still and the boat smells fresh. The current owner has refurbished the main saloon - renewing the upholstery, carpets, installing wooden Hiliary blinds, changed to LED lighting, new stereo plus speakers and new digital TV aerial installed. He has also had the Master Cabin refurbished too. The starboard side cabin can be arranged as two single berths or a double. The Eberspacher heating system has been serviced. A new canopy for the aft-deck has been acquired too. There are two fridges in total, lots of storage space and a Drinking water filter unit. Windlass controls at both helm position. Simrad DS44 Colour Chart Plotter. Autopilot ST 7000 Control Unit. Simrad CS44 Chart Plotter (linked to DS44). This 1998 model Sealine 420 Statesman is virtually identical to the F44 inside and thus making her a very good value boat. This motor boat has Eberspacher heating, teak aft deck, bathing platform and flybridge sole. She really does have a special lustre about her inside and out. Low engine hours make this Sealine 420 Statesman an attractive investment. As you would expect she is an excellent boat with plenty of power good looks and accommodation for six. The starboard side cabin converts to either two singles or a large double. The forward berth has en-suite heads that includes a separate shower cubicle. 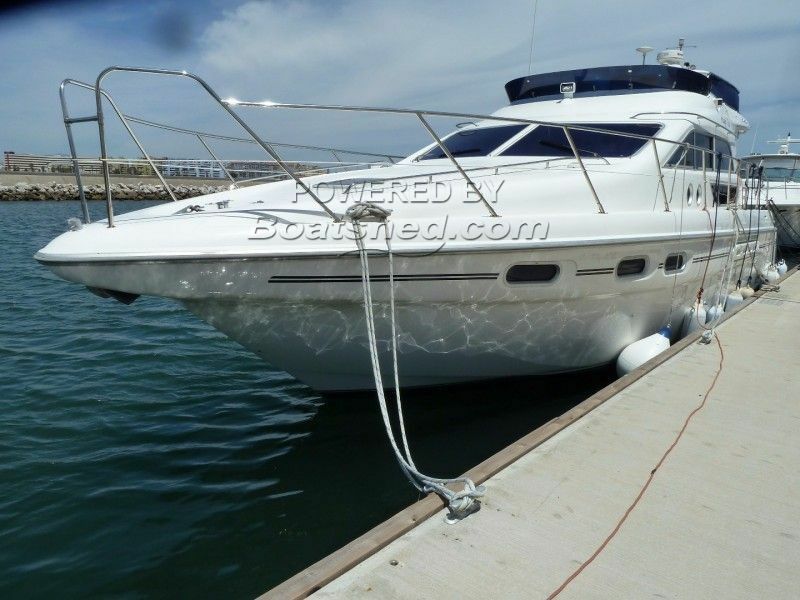 This Sealine 420 Statesman Flybridge Cruiser has been personally photographed and viewed by Andrew of Boatshed Gibraltar. Click here for contact details.